FUWA KHitch is pleased to be launching additions to its new product line at this year’s Queensland Truck and Machinery Show. These products, together with its existing product range, will help FUWA KHitch continue to supply the market with cost-effective and innovative transport solutions. 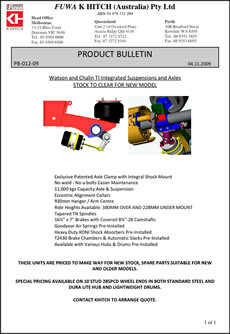 Among its new products is a fresh range of a proven worldwide suspension line in conjunction with Weweler Nederland bv. If you want more information on product releases and developments join our mailing list.